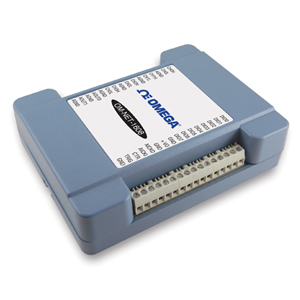 The Ethernet-based OM-NET-1608 data acquisition module is a low-cost, high-speed, multifunction I/O device that measures eight analog channels at 250 kS/s aggregate with 16-bit resolution. This device also offers two analog outputs, eight digital I/O channels, and one counter input. The OM-NET-1608 has a built-in 10/100 BASE-T auto-negotiation, high-speed communication port. The networking protocols are TCP/IP and UDP. Once connected to the network, the device can be remotely accessed and configured through software from anywhere on the network. Only one user at a time can access the OM-NET-1608. Software is required to actively communicate with the OM-NET-1608 over Ethernet. The device does not operate as a stand-alone data logger. The OM-NET-1608 provides 16-bit analog inputs that are software-selectable as four differential (DIFF) or eight single-ended (SE) inputs. The device supports input ranges of ±10V, ±5V, ±2V, and ±1V that are software-selectable per channel. The OM-NET-1608 has two 16-bit, software-paced analog outputs that can be updated at a rate of 500 S/s. The output range is fixed at ±10V. The OM-NET-1608 has an external digital trigger input. The trigger mode is software-selectable for edge- or level-sensitive mode. You can configure edge-sensitive mode for either rising or falling edge. In level-sensitive mode, you can configure for either high or low level. The default setting at power up is edge-sensitive, rising edge. Eight bi-directional digital I/O bits are individually-configurable for input or output. The digital I/O terminals can detect the state of any TTL-level input. You can configure for pull-up (5V) or pull-down (0V) with an onboard jumper. One 32-bit event counter can count TTL pulses. The counter accept inputs of up to 10 MHz. The OM-NET-1608 has one external clock input and one clock output for analog inputs. OM-NET-1608 devices are factory-calibrated. Specifications are guaranteed for one year. For calibration beyond one year, return the device to the factory for recalibration. The OM-NET-1608 module ships with an impressive array of software, including TracerDAQ®, a full-featured, out-of-the-box data logging, viewing, and analysis application. Driver support and detailed example programs are included for Universal Library programming libraries for Microsoft® Visual Studio® programming languages, and other languages, including DASYLab®, and ULx for NI LabVIEW® (comprehensive library of VIs and example programs compatible with 32-bit and 64-bit LabVIEW 2010 or later) and InstaCal installation, calibration and test utility-powerful solutions for programmers and nonprogrammers alike. These modules operate under Microsoft Windows® VISTA/7/8/10 (32- and 64-bit) operating systems. TracerDAQ PRO is an enhanced version of TracerDAQ and is available as a purchased upgrade (SWD-TRACERDAQ-PRO). A comparison of some of the features included in TracerDAQ vs TracerDAQ PRO is shown on the PDF. Digital I/O Transfer Rate (System-Paced): 100 to 5000 port reads/writes or single bit reads/writes per second typ, on local network. This is the typical throughput when the device and host are both connected by Ethernet to the same local network. The throughput can vary significantly, and typical throughput is not guaranteed if a wireless connection is involved or data is sent over the internet. Nota: Comes complete with 1 m (3.2') CAT-6 ethernet cable, universal AC adaptor, quick start guide, TracerDAQ software and operator’s manual on CD.